I just installed the Flash based tag cloud WordPress plugin WP-Cumulus of Roy Tanck and integrated it into the tag-cosmos-page. That 3D-tag-cloud is really great! It functions properly and is easy to configure. The only downer is Flash … but Roy can’t help it 😉 … the iPhone still does not know what to do with Flash and also search engines stop and do not follow links within swf files. 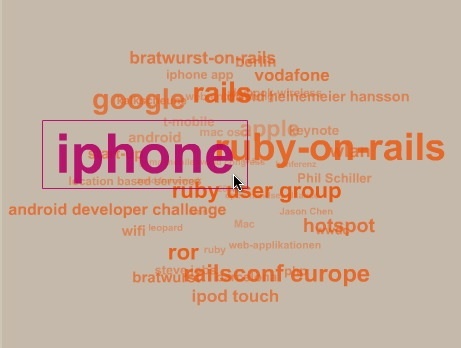 But nevertheless – the 3D-tagcloud is really fun to use … just look here, so you know what I’m talking about! Very interesting read, I think their would be a lot of mixed opinions on this. Love the theme that you are using, what is it?